Preview: The Roadrunners showed promise early in 2014 picking up a win on the road against Houston to open the year followed by a near upset against Arizona. The wheels fell off for the veteran Roadrunners after that as the team went on to just win 4 games in what was a very disappointing season for the budding FBS program. UTSA had a tremendous veteran presence last year and now the team must rebuild with just 5 returning starters back in the fold. Head coach Larry Cocker has done a formidable job bring this program into the FBS going 23-23 overall in his 4 years as the head man. A big reason for UTSA’s 2014 struggles was because of poor play at the QB position. The Roadrunners were loaded with veteran playmakers on the offensive side of the ball, but nobody was able to get them the ball. The starting QB job will come down to returning backup Blake Bogenschutz and Michigan transfer Russell Bellomy. The veteran Bellomy never impressed in Ann Arbor, but perhaps against lesser competition he’ll have an opportunity to succeed. Whoever wins the job will work behind an O-line that’s in complete rebuild mode with 0 returning starters. There’s at least some help in the backfield with RB Jarveon Williams ready to take on a bigger role. The receiving corps will look to TE Morgan and WR Bias to step up. The defense will be slightly more experienced than the offense coming into 2015, but not by much. UTSA was put in tough situation time and again by their offense in 2014, but the unit was still able to put up some halfway decent numbers. The entire starting D-line will need to be replaced, but a number of former backups have the ability to step up and fill some of the holes. The LB corps returns 1 starter with Drew Douglas back to lead the unit. Douglas is the best player UTSA has on defense and he’ll compete for all-conference honors. The secondary has the potential to be better with Big 12 transfer players Bennett Okotcha and Austin Jupe looking to make an impact. Prediction: UTSA fell well short of their expectations in 2014 and now after losing 16 starters the team finds itself in a massive rebuild. At least there’s some potential at the QB spot following a terrible 2014 for the position. The defense might only be returning 3 starters, but this group still has the pieces to build around to be formidable in conference play. A bowl game is almost certainly out of reach for this team, especially going against a brutally tough nonconference slate. 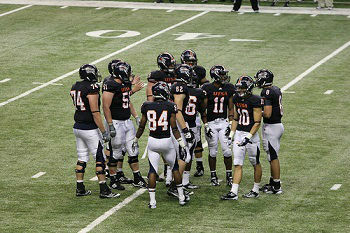 Even reaching the 4 wins of a season ago will be a tough task for the Roadrunners.